In PRODUCT 4.X.0, this plugin only supports the KVM hypervisor with the standard linux bridge. The following table lists the requirements for the hypervisor. Hypervisor KVM OvsVifDriver is not supported by this plugin in PRODUCT 4.X, use BridgeVifDriver (default). Linux kernel version >= 3.7, VXLAN kernel module enabled It is recommended to use kernel >=3.9, since Linux kernel categorizes the VXLAN driver as experimental <3.9. The following table lists distributions which meet requirements. Fedora >= 17 3.9.10 (2013/07/23) Latest kernel packages are available in “update” repository. To check the capability of your system, execute the following commands. $ sudo modprobe vxlan && echo $? # Confirm the output is "0". # If it's non-0 value or error message, your kernel doesn't have VXLAN kernel module. # Confirm the output is usage of the command and that it's for VXLAN. # If it's not, your iproute2 utility doesn't support VXLAN. When new vxlan interfaces are created, kernel will obtain current MTU size of the physical interface (ethX or the bridge) and then create vxlan interface/bridge that are exactly 50 bytes smaller than the MTU on physical interface/bridge. This means that in order to support default MTU size of 1500 bytes inside VM, your vxlan interface/bridge must also have MTU of 1500 bytes, meaning that your physical interface/bridge must have MTU of at least 1550 bytes. In order to configure “jumbo frames” you can i.e. make physical interface/bridge with 9000 bytes MTU, then all the vxlan interfaces will be created with MTU of 8950 bytes, and then MTU size inside VM can be set to 8950 bytes. Default value of “net.ipv4.igmp_max_memberships” (cat /proc/sys/net/ipv4/igmp_max_memberships) is “20”, which means that host can be joined to max 20 multicast groups (attach max 20 multicast IPs on the host). Since all VXLAN (VTEP) interfaces provisioned on host are multicast-based (belong to certain multicast group, and thus has it’s own multicast IP that is used as VTEP), this means that you can not provision more than 20 (working) VXLAN interfaces per host. On Linux kernel 3.x you actually can provision more than 20, but ARP request will silently fail and cause client’s networking problems On Linux kernel 4.x you can NOT provision (start) more than 20 VXLAN interfaces and error message “No buffer space available” can be observed in Cloudstack Agent logs after provisioning required bridges and VXLAN interfaces. Increase needed parameter to sane value (i.e. 100 or 200) as required. If you need to operate more than 20 VMs from different client’s network, this change above is required. Even if your system doesn’t support VXLAN, you can compile the kernel and iproute2 by yourself. The following procedure is an example for CentOS 6.4. # Declare the kernel version you want to build. # You may keep hitting enter and choose the default. 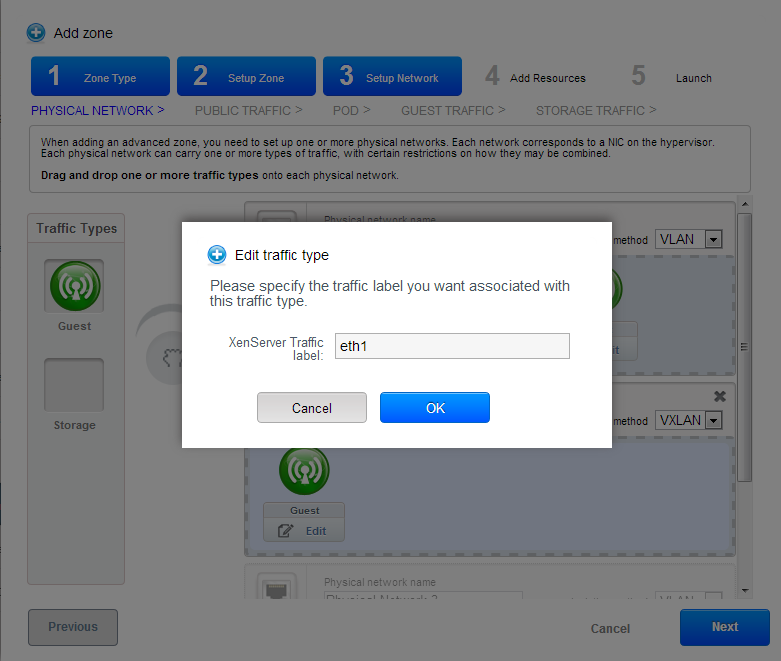 # then select "Virtual eXtensible Local Area Network (VXLAN)" and hit space. # Make sure it indicates "<M>" (build as module), then Save and Exit. # You may also want to check "IPv4 NAT" and its child nodes in "IP: Netfilter Configuration"
# and "IPv6 NAT" and its child nodes in "IPv6: Netfilter Configuration". # "Networking support" -> "Networking options"
#   -> "Network packet filtering framework (Netfilter)". # generally N = 1 + (cores your machine have). # You would get an error like "ERROR: modinfo: could not find module XXXX" here. # This happens mainly due to config structure changes between kernel versions. # You can ignore this error, until you find you need the kernel module. # find module XXXX by using '/' key, enable the module, build and install the kernel again. # so you can select the new kernel during boot process. # It's not a good idea to set the new kernel as the default until you confirm the kernel works fine. # Select the new kernel during the boot process. # Find the version that matches the kernel. # If you built kernel 3.10.4 as above, it would be v3.10.0. Please use rebuild kernel and tools at your own risk. In addition to “KVM Hypervisor Host Installation” in “PRODUCT Installation Guide”, you have to configure the following item on the host. This plugin requires an IPv4 address on the KVM host to terminate and originate VXLAN traffic. The address should be assinged to a physical interface or a bridge interface bound to a physical interface. Both a private address or a public address are fine for the purpose. It is not required to be in the same subnet for all hypervisors in a zone, but they should be able to reach each other via IP multicast with UDP/8472 port. A name of a physical interface or a name of a bridge interface bound to a physical interface can be used as a traffic label. Physical interface name fits for almost all cases, but if physical interface name differs per host, you may use a bridge to set a same name. If you would like to use a bridge name as a traffic label, you may create a bridge in this way. Let cloudbr1 be the bridge interface for the instances’ private network. you would change the configuration similar to below. Since VXLAN uses UDP packet to forward encapsulated the L2 frames, UDP/8472 port must be opened. These iptable settings are not persistent accross reboots, we have to save them first. With this configuration you should be able to restart the network, although a reboot is recommended to see if everything works properly. Make sure you have an alternative way like IPMI or ILO to reach the machine in case you made a configuration error and the network stops functioning! The default firewall under Ubuntu is UFW (Uncomplicated FireWall), which is a Python wrapper around iptables. By default UFW is not enabled on Ubuntu. Executing these commands with the firewall disabled does not enable the firewall. In almost all parts of zone setup, you can just follow the advanced zone setup istruction in “PRODUCT Installation Guide” to use this plugin. It is not required to add a network element nor to reconfigure the network offering. The only thing you have to do is configure the physical network to use VXLAN as the isolation method for Guest Network. CloudStack needs to have one physical network for Guest Traffic with the isolation method set to “VXLAN”. Guest Network traffic label should be the name of the physical interface or the name of the bridge interface and the bridge interface and they should have an IPv4 address. See ? for details. Specify a range of VNIs you would like to use for carrying guest network traffic. VNI must be unique per zone and no duplicate VNIs can exist in the zone. Exercise care when designing your VNI allocation policy.